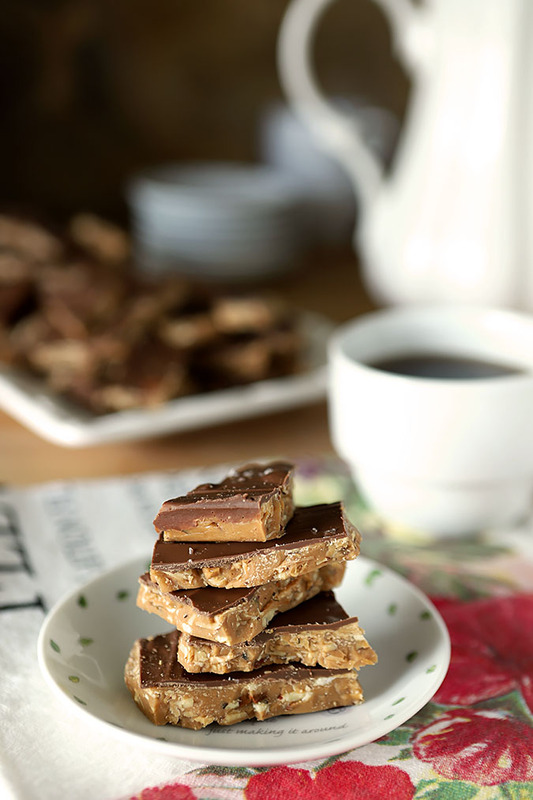 Few things are as delicious as homemade English Toffee. Except maybe Salted Chocolate English Toffee with Toasted Almonds! It’s truly the best and a great gift; just be sure to save some for yourself! I first published this recipe almost 4 years ago and while I love this toffee and the product of that effort was as fantastic as I expected, I never really shared it much. Why? Well, it was in the period when I was between homes, living with a friend while my house was being completed and working at my daughters. The toffee got warm on the way from one location to the next and ‘bloomed’ and I always hated the photos. Sure I explained what happened but seriously? These new photos have been needed for a long time; this looks more like it and now I’m happy to tell the world! I have to say that I’ve loved toffee since I can remember…I mean I actually remember when my mom would take me to the neighborhood ‘five and dime’ and all I wanted (and begged for) was a Heath bar. Every. Single. Time. True confessions? I took one once when she said no and put it in my pocket. I had no idea I was stealing from the store, I was only about 4; I just thought I was pulling one over on my mom. Ahem, didn’t work. Had to go back, apologize and return it. Saddest day of my young life. I’ve always given Heath Bars credit for my first cavity too…a testimony of my love affair that started decades ago that has never waned. So when my friend Karen offered me a piece of toffee that she had received from Peyton, one of her pre-school students (before I had even met MY Peyton! ), as a teacher gift; I think I offered that she instead take the one piece and that I would gladly take the rest. OK, maybe not but I’m sure I thought it! Now…I’ve had and made a lot of toffee over the years but this one was still especially good. Was it the technique or the ingredients or just the mastery of that mom in the kitchen? Probably a bit of all three but I had to have the recipe! Karen requested the recipe for this Salted Chocolate English Toffee with Toasted Almonds from Peyton’s mom and she was quick to comply. I knew something was different even before seeing the ingredients and I couldn’t wait to discover what it was. The toffee was a lighter color and yet had been cooked enough to harden; beyond that it just had a softer bite. Barely discernible but I just felt it wasn’t quite as rock hard as so many toffees are. I was delighted to get the recipe and discover the secret…a bit of cream is used in this recipe in addition to butter and sugar; that must have been it! Christa’s note was sweet; she was aware of ‘food blogging rules’ and even included in her email that the original recipe was from Sweet Confections: Beautiful Candy to Make at Home by Nina Wanat. Nina used to operate a very popular candy shop in Los Angeles call BonBonBar. While that store has now closed, I’m delighted to have experienced one of her confections and the book is in my Amazon shopping cart now…I want MORE! As anyone who reads this blog might expect I had to switch it up a bit cause that’s what I do and if I say so myself the end result was pretty outstanding. The original recipe calls for plain toffee topped with chocolate and sliced almonds; stellar just as it was. BUT. I only had whole almonds in the house and after one recent experience trying to slice them in my Cuisinart (can you say ‘almond dust?’) I decided that my almond component would be in the form of putting chopped pieces into the candy. Toasted ones. Oh yeah. We liked it so much I revised the recipe. The salted thing? Does everything have to be ‘salted this’ or ‘salted that?’ No, it does not. While I love just a touch of salt with chocolate and/or caramel, the truth is if you don’t have a good finishing salt, I highly recommend you avoid this step. I love Maldon salt flakes; they are less salty than table or kosher salt and are so pretty too so I can highly recommend them but trying the same thing with table salt would be a mistake. So either use a good finishing salt or none at all; either way I know you will love this toffee. So will your children, husband, dad, sister, mom or brother. Or you can send some to me. Just kidding. No I’m not. Remove from heat and stir in the vanilla and chopped nuts. Pour onto parchment and spread to desired thickness. Sprinkle chocolate on top and let sit for a few minutes; it will melt and then you can spread it to cover. Sprinkle Maldon salt on top of the warm chocolate; using a light hand. Just a bit is enough! Put the tray in the refrigerator for about 45 minutes to cool completely and then break toffee into pieces; store in an airtight container. Get a good candy thermometer every degree counts. At high altitude you have to lower the temperature. The general rule of thumb is 2 degrees for every 1000 ft. So in Denver where Christa and I live you would lower the temp by 10 degrees to 290. If you want to be really accurate you can calibrate your thermometer by putting it in boiling water and seeing what temperature it boils at. Water typically boils at 212F, whatever temp yours boils at is your difference. Mine is 11 degrees so for this recipe I would cook the toffee until it was 289F before it would be done. I like to taste mix of different flavors. Great idea for Christmas time dessert. Thank YOU Tracy! I am sharing what I love to do but it’s always nice to hear it’s appreciated and even more? That you’re making it! You’ll see…it is just the best. Toffee is also my most favorite all-time candy (I can’t say I swiped one from the store, tho!) lol ; ) I can personally attest to this amazing toffee! Christa blessed Karen and myself on more than one occassion! It is something that only exists in the imagination! Christa is awesome and has great talent to tweak it just right. I certainly like the sound of your “tweaks” as well! I know I was just bad to the bone wasn’t I (or just in that in between world of wanting but not really knowing I was doing something wrong by taking!). Fat blooms and sugar blooms on chocolate are physical defects that are frequently misdiagnosed as mold growth. Fat bloom is associated with improper temperature control. Sugar bloom is similar to fat bloom but it not greasy. I am SO going to try to make this for my husband! I am not sure if I will get it made by Sunday as we are heading to the big smoke tomorrow … but by Sunday night for sure! Barb, this is fabulous toffee! I adore chocolate-covered toffee and that dash of Maldon flakes – or better yet, a dash of smoked salt – high quality, of course – would be perfect! Gosh how good is this? I haven’t made candy since I was a kid but this I would do. The dad in our family would love it (and would prefer slightly softer, too). Fun story about how you got the recipe. It is so good Jamie…sort of glad I gave it away and yet have been craving some ever since! Yum I want someone to make me a box of this! You and I share a long standing love affair with Heath and all things toffee. 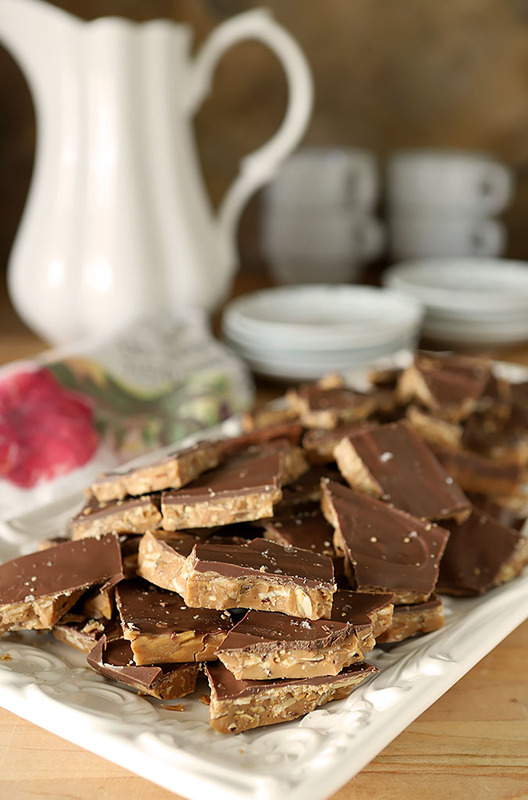 How have I never attempted to make english toffee at home? I’m not sure but I do know that now I absolutely will be creating this recipe in my kitchen. Lovely recipe!! I can practically taste it. Loved this story Barb and have bookmarked this recipe to make over the holidays! I got braces fairly early and so toffee was NOT on the approved foods list …. which perhaps explains why I too love it! Couldn’t agree more about the finishing salt! Ummm… adding cream? Oh yeah, that would totally make a difference … and a great one at that!! What a story on the making and the packaging of this wonderful toffee. It doesn’t surprise me that shoppers and clerks alike wanted to *assist* you with your tray! The packaging is great and the toffee looks amazing. Oh wow–this homemade chocolate looks amazing. What dad wouldn’t want this? Sadly mine…just diagnosed recently with diabetes at 92; huge sweet tooth too but no more shipments of sweets; guess I need to figure out how to make sugar free toffee huh? Haha! I did the same thing when I was a kid except it was with bubble gum! I also had to go back in the store, return the gum, and apologize. Guess we have to learn sometime even if the hard way? Thankfully it did not turn me off of toffee! What a gorgeous recipe! Why oh why didn’t I get myself a candy thermometer? I co owned a cookware store for a decade, but that was one thing I forgot to add to my kitchen drawer. On my list now! I did not go into the ugly details but my digital one got packed and is in storage; I used a smaller one that fell into the candy and the heat melted the protective cover. OY huh? I had to go by color alone! It can be done but I’m getting a new thermometer anyhow; I’m of the ‘better safe than sorry’ camp Lizzy. My goodness. You are dedicated. But that toffee looks worth it! Love the backstory on this!!! I was on Foodzie with Bon Bon Bar, she is so very talented, it is wonderful that she came out with a book too, I was so surprised when she closed her shop. And so…I too love toffee and can’t wait to try this one Barb! This was a new introduction for me; so glad for it too. I can’t wait to get her book! Bloom or no bloom, I still want to eat it. All of it! Most welcome Stacy; thanks for stopping by. I only wish I had squirreled some more away for me. What WAS I thinking?? What a great gift idea for Fathers Day, Barbara! This toffee looks so delicious and your packaging is adorable – awesome job! I am smiling picturing you shopping with your tray of toffee…fantastic! And I would eat this whole tray bloom or no bloom– it looks wonderful! Heath bars are at the top of my chocolate bar list and this toffee wouldn’t last long enough for me to share it with anyone. I hope to get around to making it but probably not in this heat this week. Hope your friends have AC and that you are all comfortable. I wish I had some more…but I’m with you; no way no how in this heat. Why did I think this summer would be not as bad as last year??? Yes we have AC but they sure do not like to use it…haven’t turned it on yet! Thankfully some larger trees and good windows that keep a lot of that hot sun out but about ready to go jump in the car and cool down! I love heath bars, and LOVE toffee. This looks so delicious, making toffee has always intimidated me but this recipe sounds doable. Thanks for posting this. It really is not hard but that dog business (and kids)? Makes ALL the difference. Given your undivided attention it’s pretty simple to pull off. I say do it. No, I mean DO IT!! Very good tip about avoiding table salt and using a finishing salt! I’ve tasted some things that were just inedible because the cook just didn’t understand salted caramel. (And I gotta say, good as it is, I’m about over it.) Anyway, this looks terrific! I do like a Health bar from time to time, although I’m more partial to having it in ice cream! But this looks to be a super recipe – truly good stuff! 😉 Thanks so much. I’ve got a neighbor who brings this down every Christmas. She is the same neighbor that lets me have the cherries off of her tree. I love her. She gave me her recipe several years ago and now I make it at Christmas too. I’d make it more often but I can’t stay out of it. You’ve got me craving it now. It is a great Christmas gift since it is always loved; this is most definitely my new go to recipe too. I should have kept a few pieces for myself doggone it!